Catering to the needs of the clients, we offer fine quality Printing Papers. The Printing Papers are manufactured while maintaining strict adherence to high quality standards. Our Printing Papers are appreciated for their smooth texture and excellent finish. We offer the Printing Papers in a wide range of thickness from 50 GSM to 120 GSM. 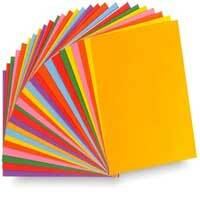 Finding applications in a wide range of stationary items, the Printing Papers are widely demanded by the clients. We offer the Printing Papers in a range comprising of Colored Printing Paper and White Printing Paper. Offering the best to the clients, we have eventually become a prominent Printing Papers Manufacturer, Exporter and Supplier in India.